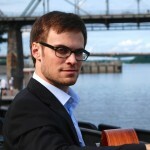 A guitarist and composer from Montreal, Renaud Côté-Giguère has performed in numerous venues and festivals throughout Canada and the United States. In 2014, he was commissioned multiple pieces from interprets around the globe such as David Tanenbaum and the Jarring Sound ensemble. In 2013, he was invited to perform at the millennium stage of the John F. Kennedy Center for the Performing Arts, in Washington, where he was broadcasted live around the world. In the spring of 2012, he was invited to play his original compositions at the Switchboard Music Festival in San Francisco. Renaud began his studies at the Conservatory of Montreal at the age of 16 where he completed his Bachelor’s Degree under the tutelage of Jean Vallières. In 2013, he was given a Master’s Degree with honorary mention at the San Francisco Conservatory of Music where he studied with Sergio Assad and David Tanenbaum. Among his actual projects, Renaud is doing research on the contemporary music of Toru Takemitsu as part of a Doctorate Degree at the University of Montreal.